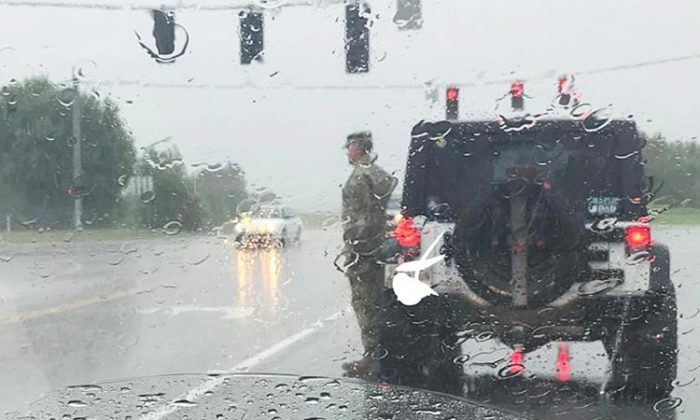 A solemn photo of a U.S. soldier standing at attention in the pouring rain quickly went viral after being shared on social media. However, it’s what the soldier said after being identified that has deepened everyone’s respect for him ever more. On July 6, 2017, Erin Hester was at an intersection on a highway in Vine Grove, Kentucky, when she noticed a uniformed soldier standing at attention outside his jeep. She was wondering why the soldier was standing in the pouring rain, until she saw him saluting as a funeral procession passed by. Hester snapped a photo of the moving scene and posted it on social media, with a lot of people praising the soldier. “I was so completely touched by this today. A funeral procession was passing by and this soldier got out of his jeep to stand at attention in the pouring rain. I always get frustrated when I see cars that don’t pull to the side and stop for a procession, but this gentlemen went above and beyond,” Hester wrote on her Facebook. “I feel pretty confident that there isn’t a military rule that soldiers have to do this. This made my heart happy to see the amount of respect that this gentleman showed a family that he doesn’t even know. #values #respect,” she added. After her post went viral, the WHAS11 located the soldier, who was identified as Col Jack L. Usrey, Senior Army Advisor, Tennessee Army National Guard. “I’m humbled and surprised at the reaction to such a simple gesture. My first thoughts were about how the bad weather can’t be helping how the family feels and I was hoping my small action would let them know we care,” he said. Personal note: This is why our Military is the strongest in the world. We have respect for all People's. He never knew if this person was a former soldier who passed or a civvy - his moral teachings show us regardless of this - his respect for the passing of another is always respectful. I do believe he did so based on his moral character within his own being. I give him a "Well Done" for his Honorable Act.